Toppers Get Four Seasons In One Day! Donaghadee Sailing Club hosted the Topper Ulster’s event last weekend and eight of our sailors made the long trip (6 hours+) north to compete. 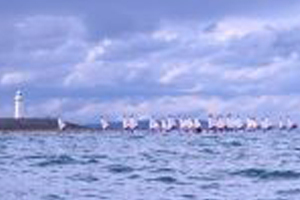 A large fleet of close to fifty toppers competed over the 2 days. Weather ranged from glorious sunshine and a gentle breeze to hail storms, thunder & lightening and over 30 knots of wind. Notwithstanding the difficult weather conditions compounded by strong tides , the Race Officer managed to complete a series and get 6 races away. Our sailors acquitted themselves very well and had five of the top ten results. These were delivered by Michael Carroll (2nd Overall), Sophie Crosbie ( 6th overall – 3rd U17), Conor Horgan ( 8th overall – 2nd U14), Conor Walsh ( 9th overall – 3rd U14) and Jennifer O Shaughnessy (10th overall). Good performances in difficult conditions also from Mia Murphy and David Jones & Ben O Hare, all finishing well inside the top half of the fleet. Special thanks also to topper parents Denis Murphy , Pat Horgan , Michael Carroll & Andrew Crosbie for co-ordinating and looking after ALL our sailors at the event and ensuring everything ran smoothly.